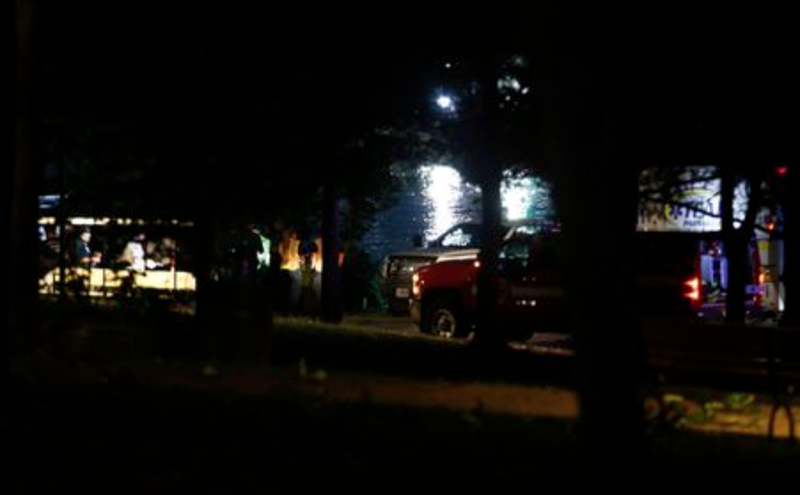 Seventeen people have been killed and seven injured (two in critical condition) after a boat capsized at Table Rock Lake between 7 and 7:20 Thursday evening. This information is according to the Springfield News-Leader. There were 31 passengers on a "Ride the Ducks" tourist boat. Table Rock Lake is near Branson, Missouri. Below is a video of conditions on the lake. It shows boats in the high winds and waves. It does not show the sinking. There is poor contrast because they are shooting through a window. However, at the beginning of the video you can see an image of the cloud base. That is the gust front (see radar image below). That is further confirmed by the fact it is not raining heavily. 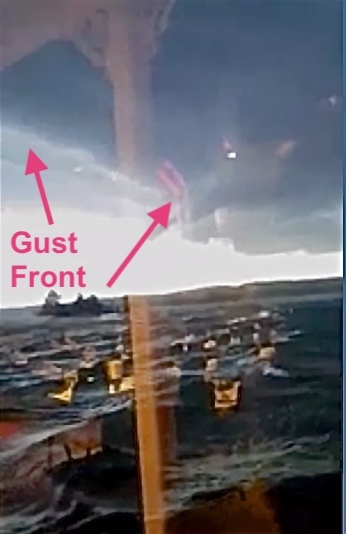 It appears the video was looking west because of the bright skies (the sun would have been in the W to WNW sky at that time). The Branson Airport reported a wind gust of 63 mph. 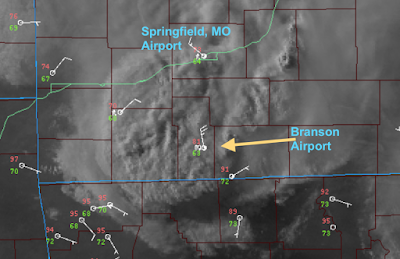 When the line went through Springfield (upper part of image), it produced at gust of 74 mph at their airport. A witness said the winds were 80 mph with five foot waves as the line of storms moved across the lake. 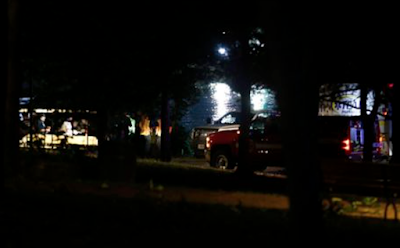 The first call to 9-1-1 came in at 7:09pm according to a just-concluded news conference. However, the sheriff didn't know whether that was a distress call or whether it was a report of the boat sinking. From the video, you can see the two duck boats were in distress for a while before the sinking occurred. Below is the type of radar display you see on television. I've circled the general area of the sinking. This was a case where there were strong winds ahead of the heavy rain. 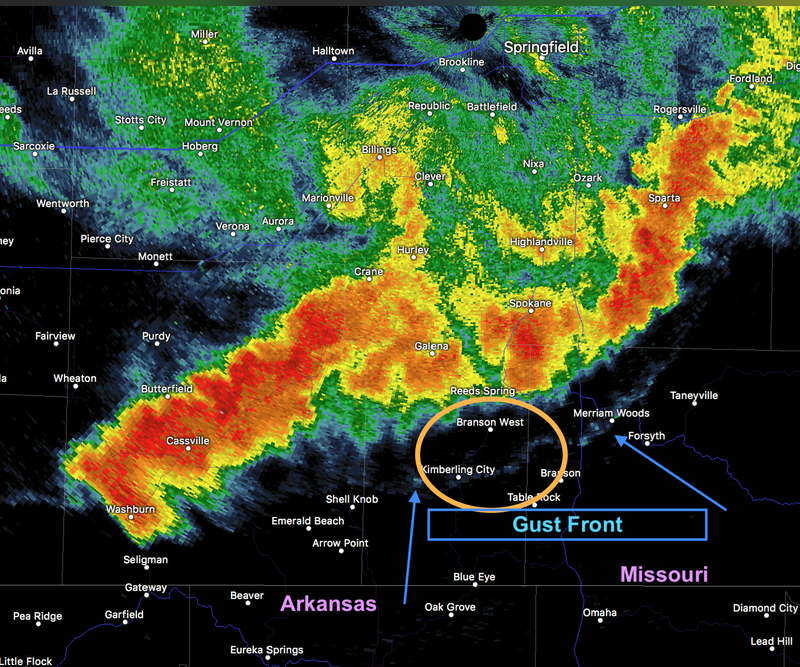 The winds were behind what is called a "gust front." It appears as a thin, irregular blue line (arrows). There were also intense winds with the heavy rain (yellow and red) when it arrived which would have decreased visibility to very low values. 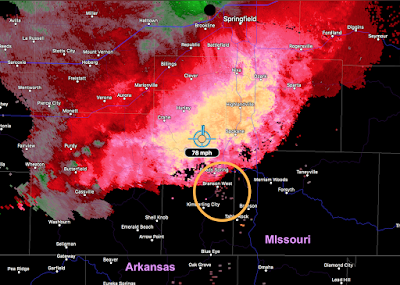 Below is a Doppler wind measurement from the Springfield NWS WSR-88D radar (top). 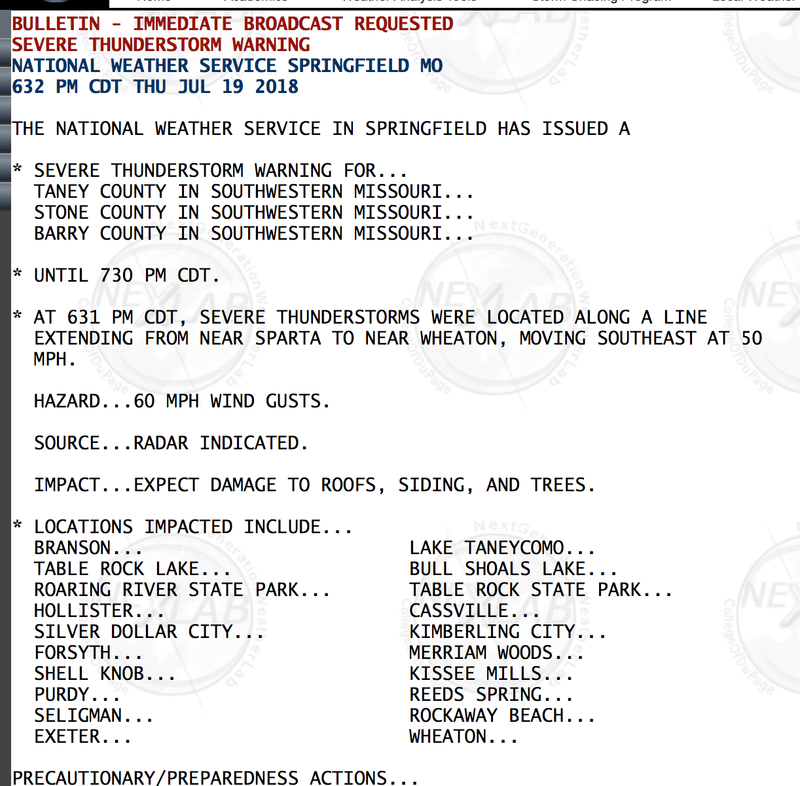 The report of 80 mph winds seems very plausible. The tan tones are generally winds of 65 mph or higher. I've highlighted an area of 78 mph winds. Below is the satellite image of the area at 7:17pm which is around the time of the sinking. 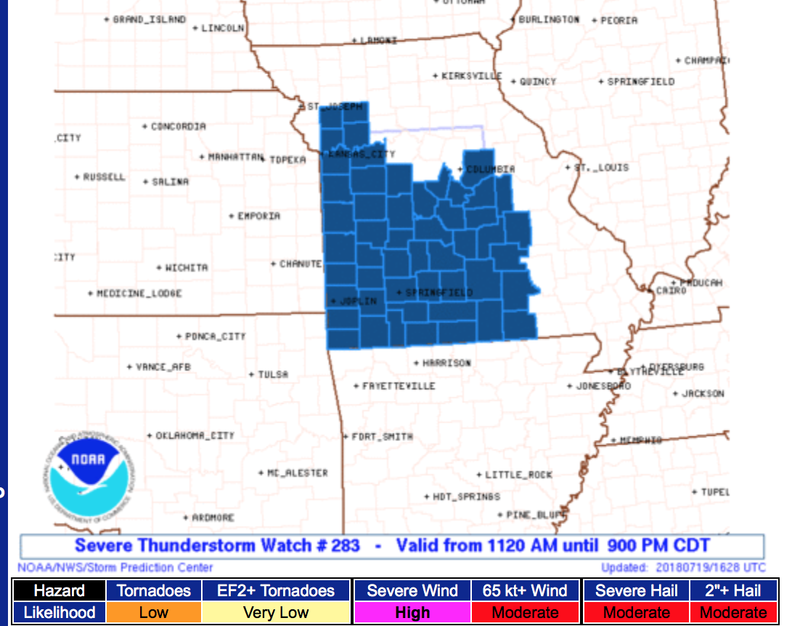 Timing is extrapolated and based on the "Local Storm Reports" from the NWS in Springfield. All of this information is preliminary but there is little doubt the weather played a role in this tragedy. 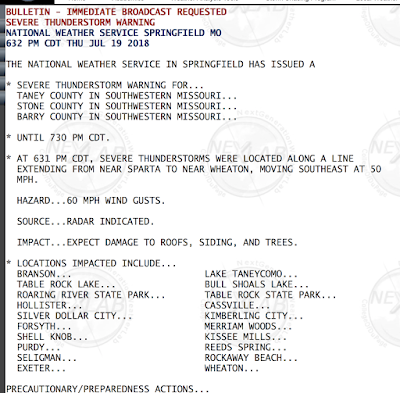 This is the severe thunderstorm warning in effect at the time of the sinking. 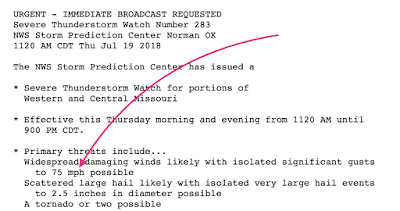 The NWS issued a severe thunderstorm warning for Table Rock Lake was issued at least 35minutes before the incident occurred. The owner of the duck boats is being quoted as saying the storm "came out of nowhere." 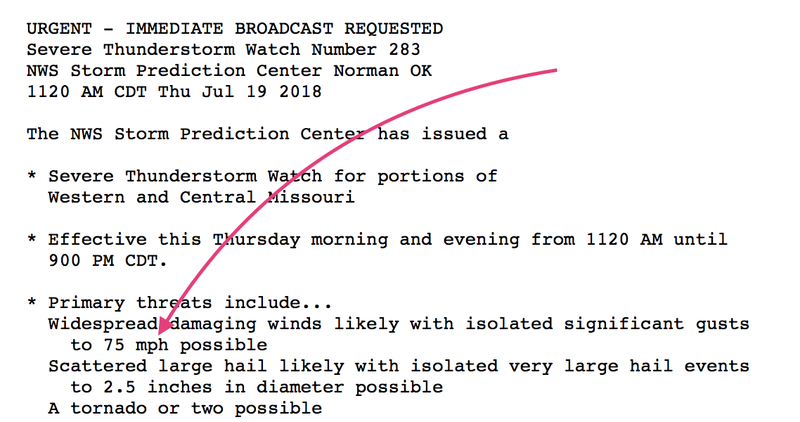 Actually, a severe thunderstorm watch for the area -- which called for wind gusts of 75 mph (see below) -- was issued at 11:20am. Nearly eight hours before the tragedy. 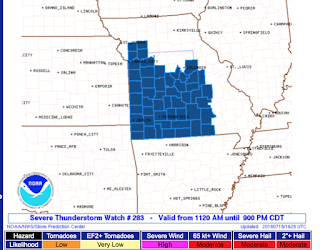 A severe thunderstorm watch eight hours in advance combined with a severe thunderstorm warning 40 minutes before does not equal a storm that comes out of nowhere. I have intentionally avoided speculating about blame because neither I, nor anyone else at this point, has all of the facts. That said, this indirect blaming of meteorologists was old a decade ago and is completely inappropriate in this particular situation.